Paul Cook does not believe Wigan Athletic have an underlying hamstring problem in the forward ranks despite Gary Roberts becoming the FOURTH victim in recent weeks. Wingers Gavin Massey and Michael Jacobs are already ruled out until well into 2019, while striker Will Grigg has an outside of being back in time for the festive period. It remains to be seen whether Latics managed to get Roberts off the field before he suffered lasting damage, but Cook isn’t reading too much into the situation. When asked if he hamstring problems were linked to training methods or general fatigue in the ranks, Cook replied: “I don’t think you can look at it like that. “These days everybody is so well warmed up before they go on nowadays. Cook is also sweating on the fitness of Nick Powell, who limped off in the second half after a heavy challenge to his left leg. “It’s too early to tell about Nick,” added the Latics boss. “But the injuries are beginning to creep up on us at the moment. 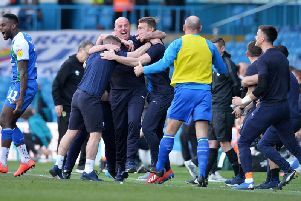 Cook also reiterated his belief that Wigan’s primary goal this season is avoiding relegation, after seeing the side slip out of the play-off picture following a dip in form. “Coming into this league...it’s such a tough league, and the calibre of teams you’re playing against is so good,” he acknowledged. “As a promoted side, the challenge for us is to maintain our status in this league. “You’re always striving and fighting to get better as a club.